Malaysian premier Najib Razak sacked his deputy premier and attorney general in a cabinet reshuffle widely seen as an attempt to strengthen his hold on power as he battles corruption allegations. has come under growing pressure in recent months over claims that huge sums of money had been siphoned off from state-owned development company 1Malaysia Development Berhad (1MDB), which he launched in 2009. Calls for Najib, 62, to step down mounted earlier this month after a Wall Street Journal report alleged that nearly US$700 million had been routed to what are believed to be Najib's bank accounts. In a televised address, Najib announced he had dumped Deputy Prime Minister Muhyiddin Yassin, who has been critical of Najib's handling of the affair and has called for transparency. He is also considered Najib's chief rival for power. Muhyiddin was replaced by Home Minister Zahid Hamidi, who is considered a Najib loyalist. In total, seven new ministers and nine deputy ministers were appointed, according to reports. Attorney General Abdul Gani Patail, who was part of a task force investigating 1MDB, also was sacked for “health reasons,’’ a government statement said. But the moves touched off speculation that Najib was attempting to curb further calls for transparency and possibly avoid criminal charges. Multiple investigations into the scandal are under way. 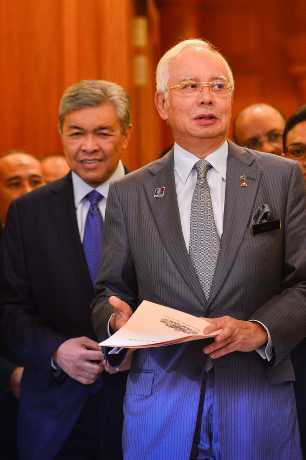 “The removal of the AG and the DPM will be seen as acts of desperation by Najib,'' said Terence Gomez, a political analyst with the University of Malaya. Legal activist group Lawyers for Liberty said removing the attorney general “is shocking to say the least, and can only fuel public suspicion of interference'' in the investigations. But he accepted his sacking. The push to oust the Najib has been led by former prime minister Mahathir Mohamad, who has warned that the political coalition dominated by the ruling United Malays National Organization (UMNO) will lose power in the next polls unless he is replaced. Mahathir led the coalition for 22 years to 2003.